MOSCOW, April 8. /TASS/. A group of three warships of Russia’s Pacific Fleet, which is on a long voyage across the Asia-Pacific Region since April 1, has docked at the port in the Philippine capital of Manila, the fleet’s press service announced on Monday. “A group of warships of the Pacific Fleet comprising the large anti-submarine warfare ships Admiral Vinogradov and Admiral Tributs and the medium-sized sea tanker Irkut docked at the port of the Philippine capital of Manila today for an unofficial visit,” the press service announced. A solemn ceremony to welcome Russian warships was held at the port in Manila, according to the press service. 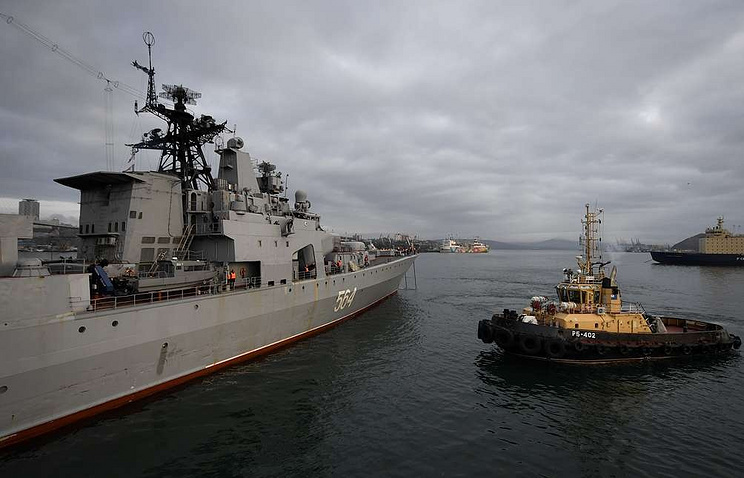 The group of Russia’s Pacific Fleet warships left the port of Vladivostok a week ago, on April 1, and, according to earlier reports, was set to visit several countries of the Asia-Pacific Region and take part in the Joint Sea 2019 Russian-Chinese naval drills. The Russian and Chinese navies will conduct their Joint Sea naval maneuvers in late April – early May. They will practice joint maneuvering and organizing communications and will conduct live-fire drills. The maneuvers will involve Chinese surface ships and naval aviation and also diesel-electric submarines from both countries. Hey Buddy!, I found this information for you: "Russian Pacific Fleet’s naval group pays visit to Philippines". Here is the website link: https://russophile.org/russian-pacific-fleets-naval-group-pays-visit-to-philippines/. Thank you.